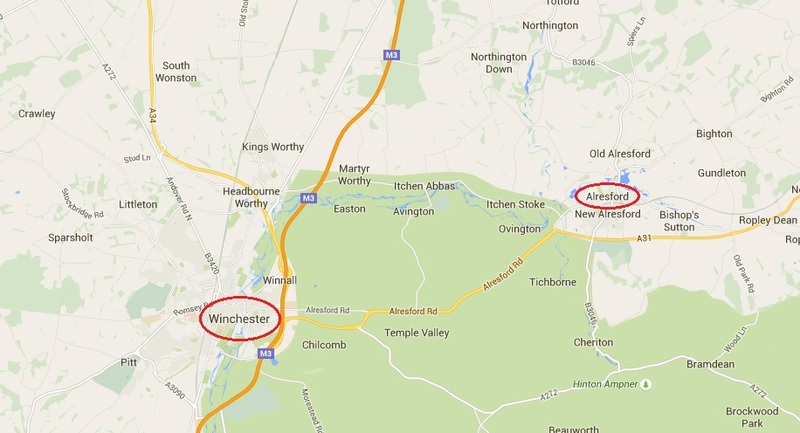 Winchester, UK, famous for its beautiful Cathedral, and Alresford, in Southern England, both home for the men of the 9th Infantry Division in 1943 – 1944. This is a nice little story about the stay of the men of the 47th Infantry Regiment in the UK, before they left for France to fight in the Normandy Campaign. It was originally published on the www.alresford.org website, and I got the permission to republish the article. My thanks goes out to everyone involved in the original article, thank you! I also want to thank Vincent Z. Whaley for allowing me to use parts of his excellent article about Hambone the dog, as published on his great website. After having fought in French Morocco, Tunisia and Sicily, the men of the 9th Infantry Division boarded the troopship and headed for England on the 11th of November 1943. The purpose of sailing to England meant only one thing – a springboard to the invasion of the Continent. These men were now vastly different from those who sailed from America to invade North Africa. Now they were an experienced combat outfit and it was felt with a little polish and more training they could match anything Hitler had to offer. During the two week 2800 mile trip, instructive talks on Great Britain began. Booklets were issued regarding the differences in expressions and customs, but also the vast difference in currency. It was the beginning of a short intensive campaign by the Division to insure proper conduct from a group of men who had spent much time away from their own people. The 9th Infantry Division was split up with units landing at Liverpool, Swansea in Wales and Gourock in Scotland. Later in the month most had reached their new quarters, which for the 47th Infantry Regiment proved to be in and around the ancient City of Winchester. A nine hour journey carried the 47th Infantry Regiment of the 9th Infantry Division down to Hampshire – i.e. Alresford, Tichborne, Cheriton, Armsworth, Bighton, Bishop Sutton and Northington Grange. The latter was to become the 9th Infantry Division’s Headquarters, where VIP’s were received and the estate was used as a storage depot for food and arms. From here all units of the Division were supplied. 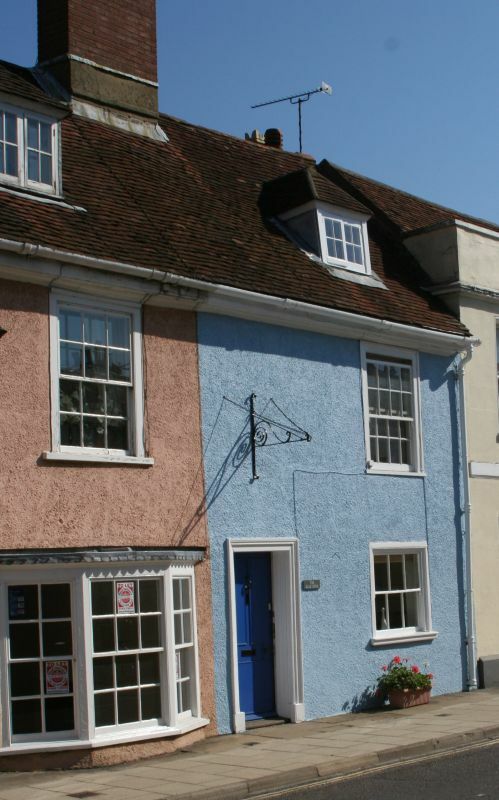 The 47th Infantry Regiment established their headquarters at 50 Broad Street, in Alresford. This occupation is confirmed by a plaque on the wall adjacent to the doorway. 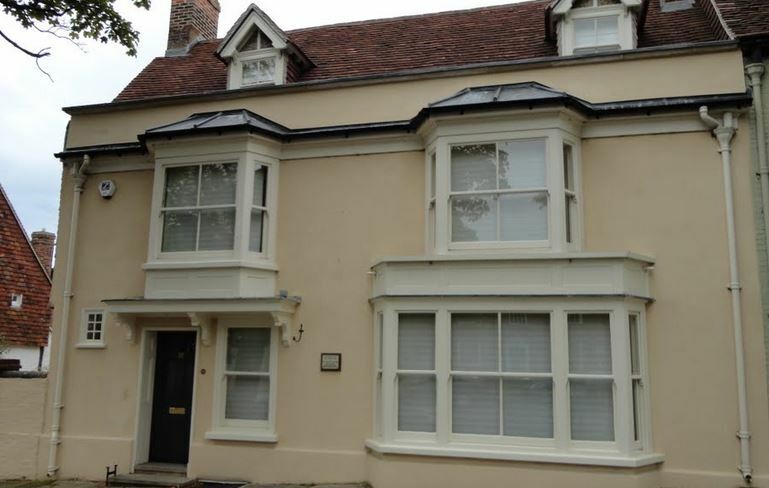 50 Broad Street in Alresford, the location of the former headquarters of the 47th Infantry Regiment in 1943 to 1944. The plaque remembering the location of the 47th Infantry’s Regimental headquarters at 50 Broad Street, Alresford. Once the preliminaries of getting the troops billeted into the various camps was completed, the men were anxious to explore the countryside and meet the local folk. However, before being allowed to leave camp and fraternize with the local people they had to attend classes. A course of instruction in manners and customs were given to each individual, followed by an examination, before daily passes were issued. Soon men were allowed to visit Winchester and London, followed by eight and ten day leave permits to go further afield. Free time was only the beginning of the pleasures. The troops appreciated the local hospitality and in towns such as Alresford the “Pubs” became their local; and mild and bitter the usual. Public houses mentioned in the Ninth Divisional Association history “Eight Stars to Victory” are – The Horse and Groom, Swan Hotel, The Swan Tap Bar, The Bell Hotel,The Peaceful Home, The Sun, The Globe, The Volunteer Arms, The Cricketers Arms, The Dean Arms, and The Running Horse. Another great attraction was afternoon teas served by a jovial lady with a limp, the men referred to her cafe as “The Tea Pot” but on making inquiries it was in fact “The Blue Door” in East Street, near where the National Westminster Bank is now situated. “The Blue Door” where the men of the 47th Infantry Regiment enjoyed their afternoon teas. 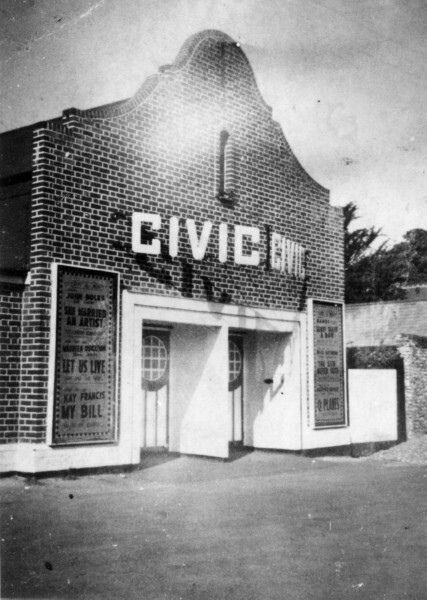 The old Civic Cinema in Station Road, where the men could relax and watch movies. During other recreational periods the Infantrymen explored the countryside on bicycles which they hired from Mr. G. Turner who owned the cycle shop on the corner of Station Road, now a greengrocers shop. 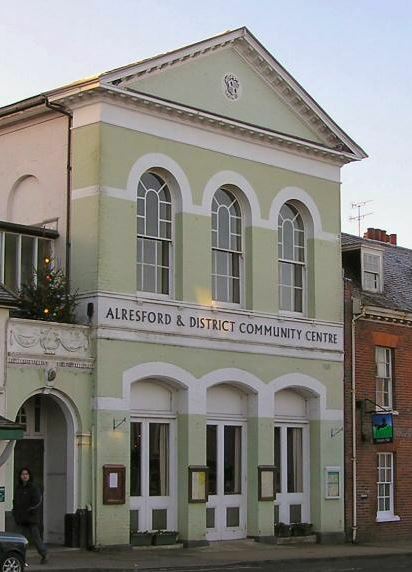 Dances were organized and held on Saturday nights at the Alresford Town Hall (now the Alresford & District Community Centre), and also in many places in Winchester. Alresford & District Community Centre where the men danced the night away with the English ladies. It’s no wonder many romances blossomed and some weddings took place. Members of the 47th Infantry Regiment owed a particular debt of gratitude to Lord and Lady Tichborne and Mr & Mrs. Campbell-Browning who furnished them with billets. A special thanks was also extended to the Mayor of Winchester, Lt. General Griffiths and the Bishop of Winchester for breaking the old local tradition: Cinemas did not open on Sundays but they permitted them to open, which not only pleased the troops but also delighted the local people; and films have been shown on Sundays ever since. Alresford fascinated the Americans with its quaint buildings and family owned shops.They marvelled at the peaceful countryside and the friendly character of the people. “Merrie Olde England” was a phrase they had heard and read and here it was in reality. Helmeted Bobbies courteously answered the mountains of questions, and driving on the left side of the road soon became natural. Christmas 1943 was a much happier period than the previous Christmas spent in North Africa. The men organized parties for the children and Santa Claus handed out gifts generously donated by the men. It was also felt to be a great honour and privilege for them to be invited to join families in their own homes. of the 47th. He recalls their great generosity especially to the local children who were never short of chewing gum and candy. As 1944 approached people began to wonder what the New Year would hold in store, would we see the end of the War? However, celebrations over, the troops settled down to training, ever mindful of the real task which lay ahead. On the 19th January General Montgomery made a personal appearance to see the men of the 9th Infantry Division. He addressed them and reminded them of the old days in battle in North Africa and Sicily. He gave no indication of where or when their next assignment would be and on the following day, 20th January, a special division service was held in Winchester Cathedral as part of the Allied Day of Prayer. that he could collect all the waste food for his pigs during the time away from Alresford.There were now so many jeeps and half- track vehicles hidden in the woods on the Northington Estate that Les gave up counting them. It eventually necessitated organizing a one-way system and the troops built a road from Northington Grange to Northbrook House, East Stratton; The Americans could always find a way around any obstacle. Les Harness also recalls a German bomber flying over with a British fighter aircraft in pursuit.It quickly jettisoned its bombs and one landed in the Northington Lake and another in the Park, causing some damage to the gardener’s cottage. Speculation among the local people suggested the Germans may have had knowledge of the American activities at Northington, Micheldever and Alresford. Indeed, a German bomber plane did crash in Cheriton Wood and Toby White remembers British soldiers checking the wreck and finding a map in the cockpit showing red circles drawn around the Micheldever area. On the 24th March 1944 Prime Minister Winston Churchill and the Supreme Commander, General Eisenhower, arrived in Winchester. They visited the various U.S. camp sites along with General Bradley, Commanding Officer of the 9th Infantry Division. General Bradley was instructed to gather his men together whilst both Winston Churchill and General Eisenhower addressed the Division about the forthcoming major battle. 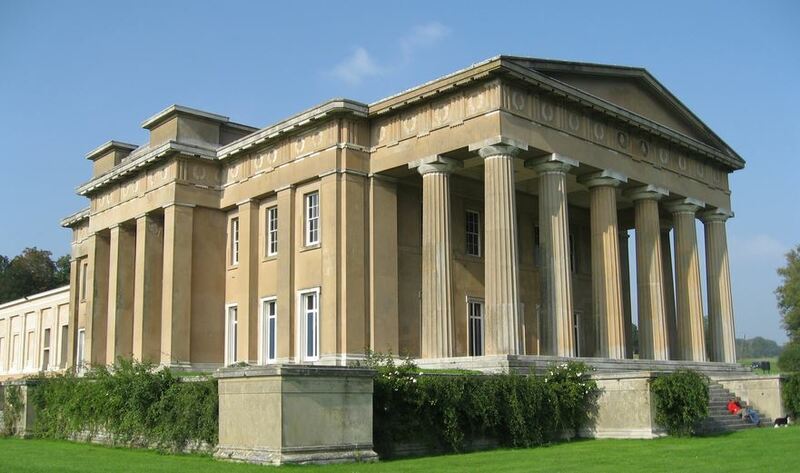 Afterwards, under tight security, Winston Churchill, General Eisenhower and General Bradley met at Northington Grange and history tells us this visit was to plan their role in the forthcoming invasion of France – code name Overlord – also, to determine the moral of the U.S. troops. Mr. Harness remembers seeing the convoy of cars enter the Grange, VIP’s walk into the building and then close the large doors. Guards were posted outside and the meeting continued for 2-3 hours. Shortly after this visit all leave and furloughs were cancelled. It was then the men knew their stay in Hampshire was to prepare for their next military operation, i.e. D-Day. At 0630 hours on the 27th of May 1944, the 9th Infantry Division was put on a six hour alert and events quickly began to happen. There was little or no chance for goodbyes or any last minute business and absolute secrecy was to be maintained. The sudden absence of American troops in Alresford, and other places, was evidence that something important was about to take place. Small groups of people gathered at street corners and there was much speculation as to what it could be – were the British and Allied Forces ready to invade France? By Saturday 3rd June, all roads to Southampton were jam packed with Army vehicles and troops and once more the men of the Ninth were on their way to battle. Whilst on the move there was no time for private thoughts but once on the boats troops began to reflect on those memorable days spent in the quiet Hampshire towns and villages. Hambone Jr. the 47th Infantry Regimental dog. Aside from taking leaves to nearby London and partying in Alresford’s many pubs, the soldiers of the 47th Infantry Regiment had someone special to help keep their minds away from the stresses of combat. A dog named Hambone Jr. scurried alongside the soldiers and kept them company until the troops departed Alresford in May 1944 for disembarkation to Southampton and Portsmouth and eventually to the shores of Utah Beach in Normandy, France. According to New Alresford resident Glenn Gilbertson, Hambone Jr. is remembered as a “brown and white, scruffy little terrier“. “Apparently his original name was Whisky, but the GIs named him in honor of a cook whose nickname was ‘Hambone,’ ” Gilbertson said. 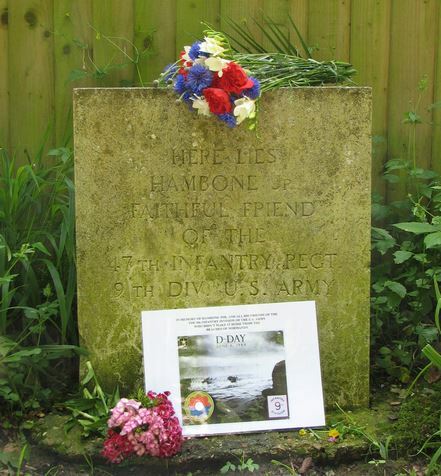 Unfortunately, Hambone Jr. ran in front of an Army vehicle departing Alresford for Portsmouth and Southampton in May 1944 and was killed when a truck, possibly a deuce-and-a-half, ran him over. Les Harness, who owned the estate at Northington Grange, knew that “Hambone Jr” was greatly missed and that the men were very upset. So he gave them another dog named “Spider”, and he soon also became a great favorite and went everywhere with the 47th Infantry Regiment men. Once the troops left Northington, “Spider” was never seen again and it is thought he may well have accompanied them all the way to France. During the journey in landing craft and troopships the men’s thoughts would be of girlfriends and other friendships, tea and scones, mild and bitter, fish and chips and waiting for a double decker bus. For many of these U.S. Infantrymen it was the first and last visit to England, and owing to the bitter fighting around Cherbourg with strong opposition from crack German Panzer forces, they suffered heavy losses. 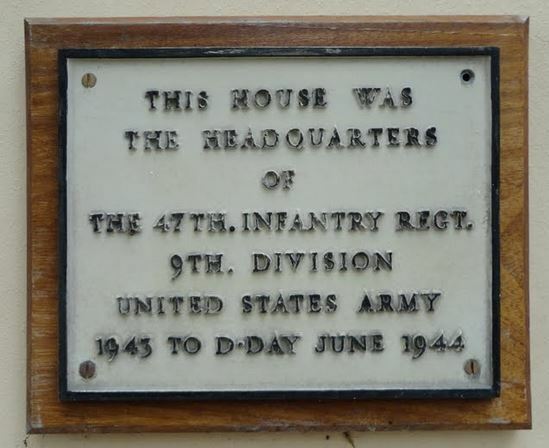 During the actions in Normandy, the 47th U.S. Infantry Regiment, that was billeted in and around Alresford, received their first Distinguished Unit citation in battle which reads “The 47th Infantry Regiment is cited for extraordinary gallantry and outstanding performance of duty from 21st to 26th June 1944, during which time it assaulted and captured four heavily fortified enemy held positions and penetrated the heart of Cherbourg”. At the end of World War II the U.S. Ninth Infantry Division published facts and figures of their casualties totaling 22.292.